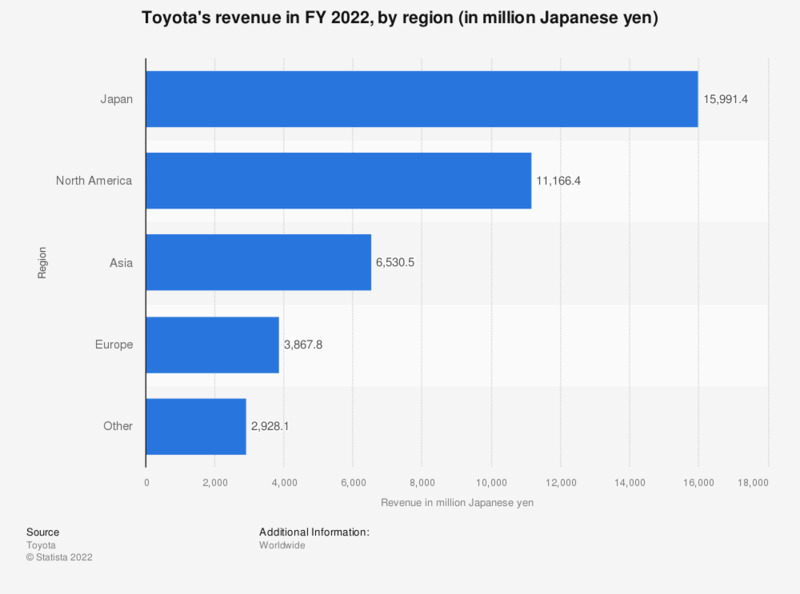 This statistic represents Toyota's revenue in the fiscal year of 2018, by region. Toyota's revenue in Europe amounted to approximately 3.2 trillion Japanese yen (or approximately 28.4 billion U.S. dollars). Japan-based Toyota Motor Corporation ranks among the largest automobile manufacturers in the world. * The figures are for the year ending March 31. One Japanese yen is approximately equal to 0.0089 U.S. dollars (as of December 31, 2017). Everything On "Toyota" in One Document: Edited and Divided into Handy Chapters. Including Detailed References.